Fee: $30/$25 members - includes an autographed copy of As Bright as Heaven, refreshments from MKE Localicious, and admission to the sculpture garden. Register by phone at 414-446-8794. Lynden Sculpture Garden's Women's Speaker Series and Boswell Books welcome Susan Meissner, author of As Bright as Heaven, to the Lynden Sculpture Garden, Monday, April 9, 7 pm. The 1918 Spanish flu pandemic infected about one-third of the world’s population at that time and killed more than 20 million people, including 675,000 Americans. 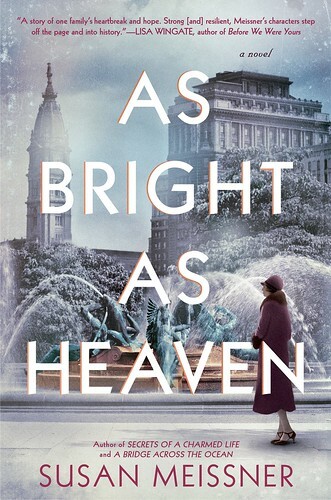 In the richly imagined and evocative As Bright as Heaven, Susan Meissner explores the epidemic’s impact on one American family living in Philadelphia—from the first hints of the disease as World War I draws to a close to its far-reaching consequences. Ready for a fresh start, Pauline and Thomas Bright prepare to depart their small-town life, hoping to find a better future for themselves and their three daughters by taking over a relative’s undertaking business in Philadelphia. But only months after arriving, a dark cloud of fear and uncertainty settles over the city as countless friends and neighbors rapidly succumb to a mysterious and deadly disease. Struggling to keep their overwhelmed funeral home running, the Brights find themselves personally impacted by the flu. But with tragedy arrives an unexpected gift in the form of an orphaned baby boy—a beacon of hope in the family’s grimmest hours. Told from the multiple perspectives of Pauline and her three daughters—Evelyn, Maggie, and Willa—As Bright as Heaven highlights the Bright women’s strength and resilience as they hold their family together through the worst of times. Epic in scope but intimately depicted, As Bright as Heaven will appeal to the same readers who made The Nightingale, The Orphan’s Tale, and Lilac Girls runaway bestsellers. Susan Meissner is a former managing editor of a weekly newspaper and an award-winning columnist. She is the award-winning author of Secrets of a Charmed Life, A Fall of Marigolds, A Bridge Across the Ocean, and Stars Over Sunset Boulevard among other novels. Visit her online at SusanLMeissner.com, Facebook.com/Susan.Meissner and @SusanMeissner.